Scaling the high bluffs, overlooking the sandy beach and Atlantic Ocean, the home’s design takes advantage of the ocean views from every main living space, yet provides the homeowners with privacy to relax and enjoy the ocean breezes. 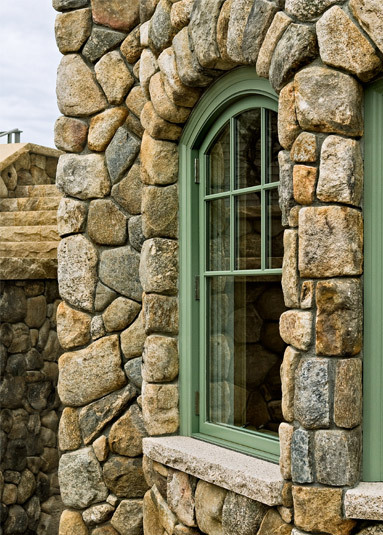 The sweeping stone foundation and dramatic gambrel rooflines differentiates the residence from its surroundings. 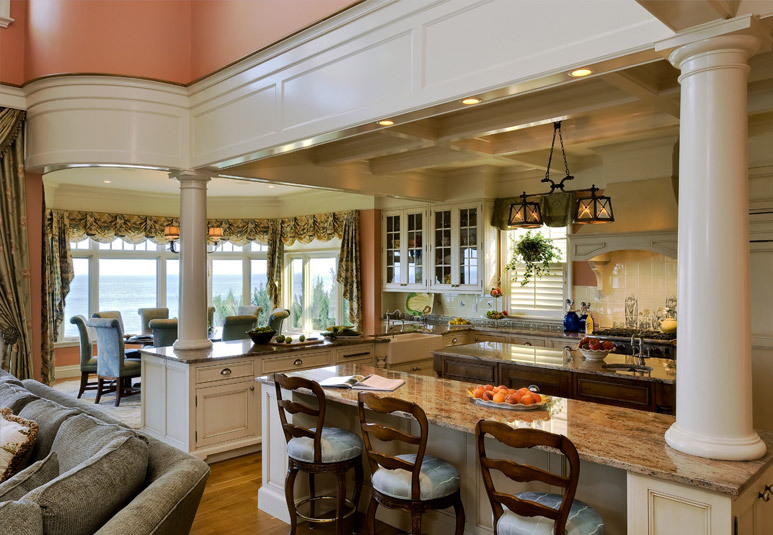 The homeowners wanted to be able to take advantage of the dramatic ocean views from every room; an open floor plan and minimal separation between the casually designed interior accomplished this objective. 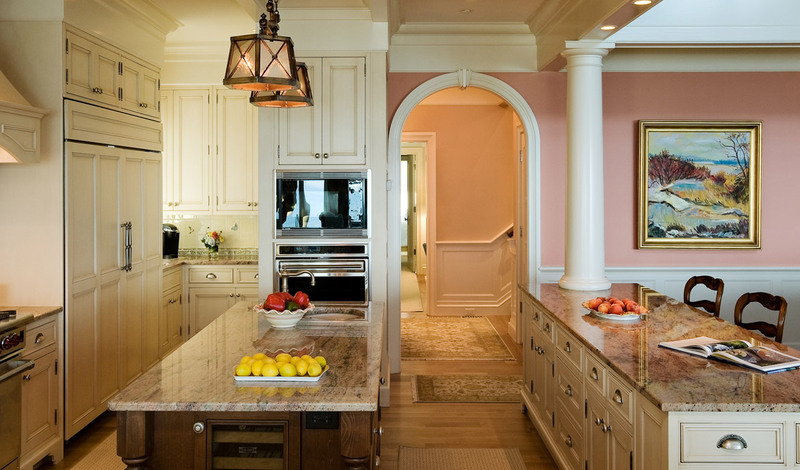 The home’s interior is enhanced with a careful attention to detail as demonstrated by the bold ceilings and textured walls that extend deep into the interior of the house. The building site was not only challenging with its quick elevation changes but also with its narrow – 75′ wide by 180′ long – lot with 10′ setbacks on either side. The site, located in a flood zone, required the architect to comply with very strict ordinances and building codes. The garage is positioned closest to the street to create a buffer between the street and the homeowners’ main living spaces. A finely detailed entrance tower greets guests as they approach the house through its beautifully landscaped street facade. The main living spaces are on the first and second floors, using the lower level that is tucked into the side of the bluff as the home’s utility spaces. The home’s exterior is constructed of low maintenance materials; the only wood product used is the cedar shingles. The elaborate exterior trim and lattice work is made from synthetic “Azek” that will not degrade in the harsh New England seacoast weather. 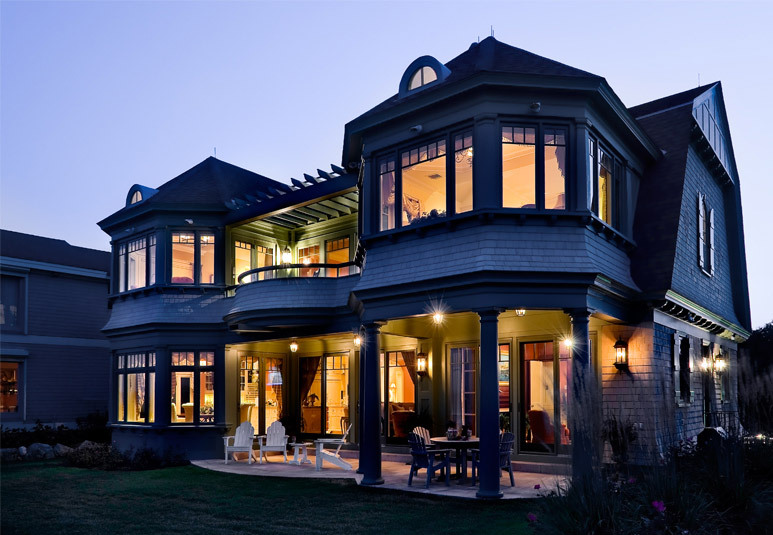 The ocean-facing windows are made with hurricane glass to withstand any New England storm and the roadside windows are constructed from triple-paned glass to cut down on any unwanted road noise. Integration of Hydrostatic Relief gates into the foundation to meet local and state flood zoning codes.